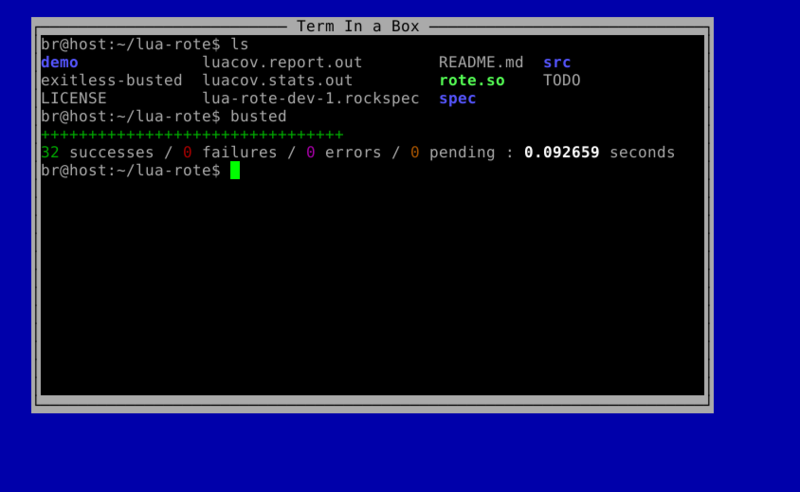 Curses and luaposix are needed for drawing state of ROTE terminal on curses’ WINDOW object (method RoteTerm:draw()). If you do not need this feature and want to exclude these two dependencies, then remove CURSES and luaposix from file lua-rote-*.rockspec. See shell script with installation commands for Debian Wheezy. This library is built using LuaRocks. Unit tests are written using unit testing framework busted. Unit tests can serve as reference documentation and code examples. getch(), results of which are passed to ROTE terminal. Currently lua-rote does not support unicode characters, that is why busted was changed to produce “+” instead of “●”. There are some differences between boxshell.c and boxshell.lua. Program boxshell.lua can fork other commands as well as bash. boxshell.c uses nodelay mode repeating draw-getch cycle without a delay, while boxshell.lua uses halfdelay mode repeating draw-getch cycle 10 times a second. That is why boxshell.c constantly consumes 100% CPU, while boxshell.lua consumes almost no CPU when inactive. All code of the library “lives” inside this module. The main part of the library is class RoteTerm. It wraps C structure RoteTerm, declared in library ROTE. RoteTerm represents terminal emulator. Instance of RoteTerm is destroyed automatically when the corresponding Lua object is collected. The command will be interpreted by ‘/bin/sh -c’. Returns PID of the child process. On error returns -1. Notice that passing an invalid command will not cause an error at this level: the shell will try to execute the command and will exit with status 127. You can catch that by installing a SIGCHLD handler if you want. If you want to be notified when child processes exits, you should handle the SIGCHLD signal. If, on the other hand, you want to ignore exitting child processes, you should set the SIGCHLD handler to SIG_IGN to prevent child processes from hanging around the system as ‘zombie processes’. You can use luaposix to manage child processes as described above. See file demo/boxshell.lua. If, however, you want to be tidy and inform the RoteTerm that its child has died, call method forsakeChild when appropriate. You can get the PID later by calling rt:childPid(). Before getting any output from the child process, call method rt:update() to update internal state of RoteTerm. lua-rote provides several functions to handle attribute values. -- Puts data ':wq\n' into the terminal. -- If there is a forked process, the data will be sent to it. -- be injected into the terminal (as in inject()). -- Inject data directly into the terminal. -- Indicates to the terminal that the key has been pressed. -- Appropriate escape sequence is passed to method write(). You can get values of keycodes from posix.curses. Snapshot object is deleted automatically when the corresponding Lua object is collected. An ‘attribute’ as used in this library means an 8-bit value that conveys a foreground color code, a background color code, and the bold and blink bits. Each cell in the virtual terminal screen is associated with an attribute that specifies its appearance. Unicode characters are printed and read with errors. ROTE can’t read cell 0x0 in 1x2 window when reads second time. It seems to be related to low number of columns. ROTE was written by Bruno T. C. de Oliveira, see rote.sourceforge.net for more information.